After the overt tragedy of Sanshô Dayû, the film prior to both Chikamatsu Monogatari and Yôkihi in the Masters Of Cinema Kenji Mizoguchi set, it's little surprise to find the director sticking to, and increasingly fascinated by, tragedy. Both of these tales follow a fairly traditional tragic arc; one concerned with an adulterous relationship, the other with the increasing power of a single family, in 8th Century China. Like Sanshô Dayû though, Mizoguchi's main problem here is not that he can't 'do' tragedy but that he wallows in it too much. In both films, once Mizoguchi has reached the final third, the door is well and truly open to as much heart-rending and wailing as possible. All of his characters pursue actions seemingly designed to enable Mizoguchi to ward them towards terrible ends; to plonk them on-screen and stare misty-eyed into the camera. A handful of these moments would be fine but, essentially, the entire final acts of both Chikamatsu Monogatari and Yôkihi are comprised almost solely of this sort of thing. The former is the worst offender, all the more frustrating given how well managed its story is at times. Caught in an impossible position, after a fairly believable coincidence, Mohei (Kazuo Hasegawa) and Osan (Kyôko Kagawa) decide to run away, having been falsely accused of adultery, the penalty for which is crucifixion. As the narrative moves on, Osan starts to fall for the noble Mohei, thus making their predicament at least factually accurate, as various forces pursue them in the background. A rarity for Mizoguchi at this point, it is refreshing to find that his lead male character here is not as flawed as most of his others. Mohei may make the wrong decision on occasions, and certainly helps to set the tragedy in motion by being too nice (another Mizoguchi trait), but he's also noble enough to attract Osan, tired of living under the tyranny of husband Ishun (Eitarô Shindô), who more aptly conforms to Mizoguchi type. When the final third arrives, both characters appear to not only admit defeat rather readily but proactively pursue it, hiding out obviously and in turn at various parent's houses. Mizoguchi wants his tragic ending and he is going to get it, no matter how flagrantly stupid it may make his characters appears. There's little difference in Yôkihi, where lead Yang Kwei-fei (Machiko Kyô) goes through a lot of hand-wringing to tear herself away from empirical lover Xuan Zong (Masayuki Mori), only to inexplicably return to him in the closing moments, a fact so patently unbelievable that it has to be explained via non-dialogue related subtitles. More so than Chikamatsu Monogatari this contrivance is a shame, with Yôkihi, the first colour film of the set, proving a very interesting piece to that point. There's real questions around quite why the emperor turns to Yang Kwei-fei and then, subsequently, why she stays with him, her journey not being too dissimilar to that of Eiko in Gion Bayashi. That fact perhaps hints at where a box set like this might fall down, especially when you watch all of the films contained therein in a rather short sequence. 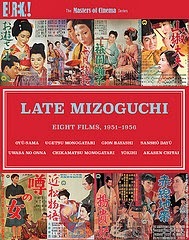 Comprising a spell of five years where Mizoguchi worked for film studio Daiei, there are plenty of similarities, with similar stories swapping protagonists, motivations or settings. Ultimately though, with one film left to go in the series, Mizoguchi is interested in female characters, often of different status, often drawn to, or involved with, men who may not be all that good for them. In the cases where this deviates to some degree or another (Sanshô dayû, Ugetsu Monogatari) we see essentially the same thing, with the perspective shifted to the male character. 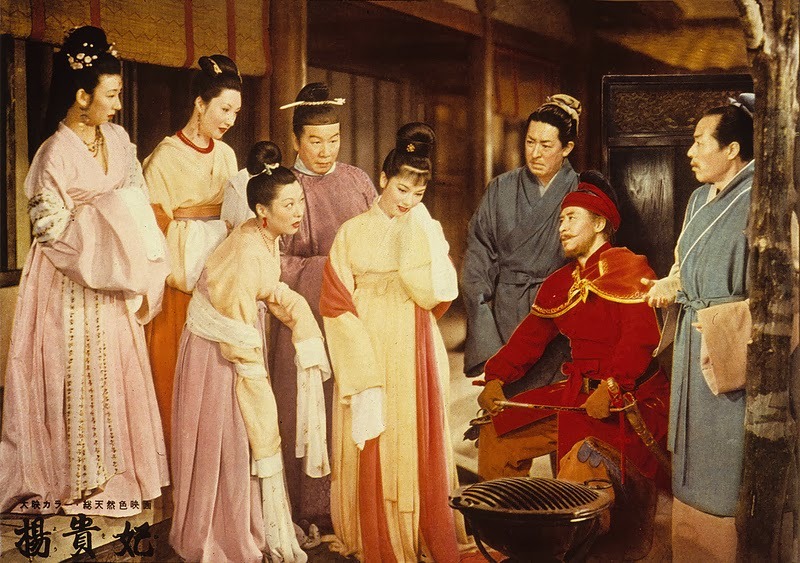 Yôkihi provides little variation on this, though it does heighten the class difference between Yang Kwei-fei and the Emperor, Mizoguchi perhaps reaching his zenith in terms of how he can tell that particular story.